"Is there a telescope store?" In the last game Dwannis Muck-Mug (Andrew), Raskavas (Jeff) and Bodie Jarmakerson (Elijah), had boarded a ship and made their way to the mysterious island that sat on the back of an octopus out at sea. 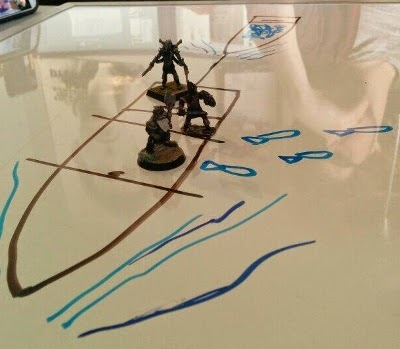 Their ships had been attacked by Goblin pirates, a Dragon Turtle and the Octopus itself, but they made it to the island with their boat mostly in tact. However they had not brought any supplies with them, and the crossing had injured each of them severely. Thankfully, since Tom was unable to join last game, we had left his character back in Bellwick with the men. A few Message spells from Dwannis should be enough to convince him to cross with some supplies, and at least warn him of the dangers that lay between him and us. Sayer found himself standing out front of Bellwick's town hall. The camp of the Frunner's followers that Raskavas and Bodie had rounded up surrounded, him but many had gone off; continuing to loot the town. All that remained of his fighting force were the eight men he had taken with him when he barricaded the road Conquest of Frey Game 6. Feeling he needed supplies, he asked them to go into the city and gather as many potions as they could find. As his men went off into town, Sayer started to fret about the fate of the rest of the party. It had been many hours since he had heard from them and he was growing worried. As he considered ways of ascertaining their fate, he uttered the quote of the evening, asking Dave -The DM- "[if] there [was] a Telescope Store." After a laugh, he was informed by Dave that there was no "telescope store" and that due to the looting and general anarchy it would be unlikely that any store would be open. Thinking for a moment, his slow Barbarian brain figured that the best thing to do would be to go over to the island himself and investigate. All he needed was a boat. He found a sea worthy vessel at Bellwicks docks: it was a larger fishing ship, but it would do the trick. he knew he would need his men and their supplies for the crossing, so to make sure they could easily find him, and in the hopes it would stop anyone form looting it, began the process of "claiming" the ship by scrawling his name along the sides, with some paint he found in a near by shed. Sayer starts to paint his boat. Being illiterate, it took him hours, and was frankly a miracle that it said anything at all. Scene 2 On the Beach, on the Octopus. While Sayer slowly painted his name on his boat, Dwannis, Raskavas and Bodie awoke from their concussions, finding themselves scattered around the deck of their ship. The vessel seemed mostly intact, and only a single sail had torn. They tore down the tattered sail and used it to form a makeshift tent for themselves. With shelter procured, they began looking for something to eat. There were several crates of fresh fish on the ship, but only the Duergars; Bodie and Dwannis could eat it with out getting sick (as Duergar ar immune to all forms of poison). Raskavas, the Drow, on the other hand would have to cook his fish or risk severe food poisoning. There was almost no dry kindling to make a fire with on the beach, but after some searching, they found enough dried leaves and some dry bits of wood to get a fire started. However, they had nothing to light it with! At first Dwannis tired to use a Shocking Grasp spell to ignite the leaves, but to no avail. In the end, and after wasting two spells, Dwannis gave up, and Bodie set about rubbing two sticks together until a he got a small fire going. Using the blaze and some near by sticks, the three cooked their fish and rested their trying ordeal. After their meal, Raskavas suggested to Dwannis that he use one of his Message spells to tell Sayer to bring help. 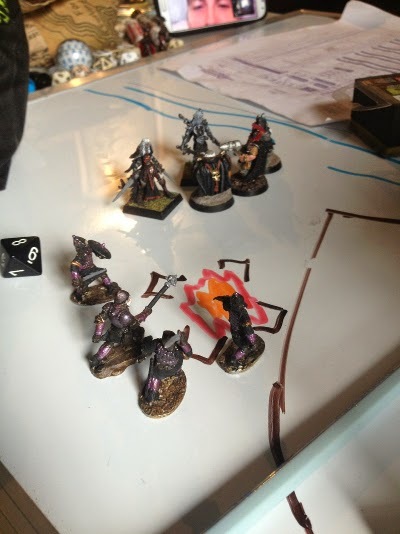 Thankfully the Necromancer had two Message spells prepared, and he used one to summon sayer to the island with supplies, a cleric and troops. Scene 3 Sayer and the Clerics. Sayer received Dwannis' message just as he finished crudely painting his name on the side of the boat. Wasting no time, he dropped his paint brush and headed into town. He was hoping to find the Cleric Doris who had begrudgingly helped them last time, and had heard she was in the village healing the injured where ever she could. Doris was easy to find, and Sayer asked her if she would be willing to help them. With the calamity the party had casued in Bellwick, and Sayer's social ineptitude, she refused; stating that she would be of more use in Bellwick then on some fools errand to the Island. But to Sayer's luck, no sooner did the words leave her mouth, where they over heard by a traveling Duergar Cleric. His name was Vlagard (Adam), and he introduced himself to Sayer as a Cleric of Life and Death. He had overheard Sayer's conversation with Doris, and was interested in this mysterious island. Sayer told him the tale, and Valgard agreed to join, on the condition that he would get his share of the spoils. Sayer agreed and asked Valgard to come with him to the town hall. He hoped his men would be there with the supplies he told them to get. They would need it for their voyage. Scene 4 Sayer's men. The Crossing. On their way to the town hall Sayer spotted Franky, one of the men he had sent out for supplies. Franky was fraternizing with one of the town's women, and it did not look like he had found any supplies. Sayer shook his head figuring that Franky was a lost caused and continued on in the hopes that his other men were more reliable. Of the eight Sayer had sent off, seven were waiting for him at the camp. it would appear that only Franky was missing. Despite thelenght of the seven's search, they had only been able to dig up seven cure light wounds potions, and one cure moderate wounds potions. It was a good haul, but given the injuries of the rest of the party, and the trials ahead it would not be enough. Resigned to bring what little he could, Sayer gathered his men, and he and Valgard headed towards his ship. Just before they left, Franky came running around the corner, holding another four cure moderate wounds potions. Apparently he deep in "negotiations" with the other woman to acquire him. Good ol' Franky. Feeling more prepared, the group made their way towards the docks. Once there, Sayer received another message from Dwannis. He warned them that there was a monster in the deep, and that they should fill a decoy ship with bait. It was cryptic, but Sayer took the scant message and made with it what he could. He tied a second, smaller fishing boat to his vessel and loaded it with crates of stinking fish. The idea was that they would tow this boat out to sea, and then cut it loose when they spotted the monster. When they set out to sea, everything was going to plan until they hit some rough waves and the boat they were towing began to list. In their haste, they had forgotten to secure the steering wheel on the vessel which caused it to lurch about as the wind and waves would take it. Seeing the risk of of capsizing, Sayer, in an act of unmitigated bravery, crawled across the tow rope and managed to secure the the steering wheel on the fishing ship. With the rudder secured, the towed ship stopped jerking about, and sailed smoothly. With his task complete, Sayer crawled back to the main ship, and resumed his place at the wheel. Feeling they were far enough out to sea, Valgard and one of Sayer's men began pushing some of the fish they had brought with them into the water. 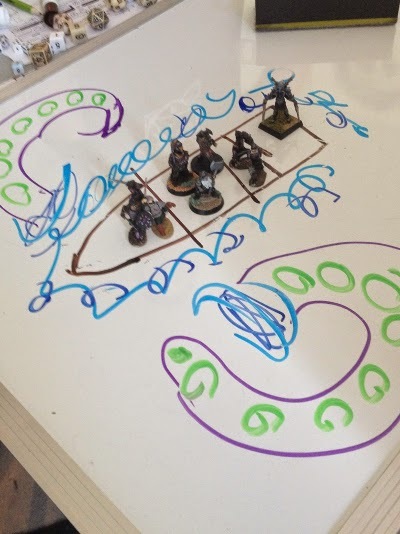 They were preparing to distract the sea monster with the baited ship, but first they needed to get it's attention. When they finished emptying out the barrel of fish, Sayer cut the rope on the bait boat, and sailed away as quickly as he could. Within moments, a dark shape rose from the depths. and capsized the bait boat. The shell of a dragon turtle broke through the water, going into a feeding frenzy. When they were a good distance away, Sayer, Valgard and the men sighed a sigh of relief. As far as they knew they ahd beaten the monster and everything was safe. But their sigh was premature. As they approached the island, the waters churned beneath them. You see, Dwannis had enough Message spells to ask Sayer to come, and and to warn him that the dragon turtle may still be alive, but he didn't have enough to tell him about the colossal octopus the island seemingly rested on. There was nothing to be done but hope they survived as they did. Two great tentacles burst from the water and the men cried out in terror! One of the arms gripped the ship; crushing it to pieces, sending Sayer, Valgard and the eight men hurdling into the sea. Wreckage flew all around them, Then everything went black. Scene 5 Meeting on the Beach. Entering the Castle. Sayer awoke on the beach surrounded by four of the eight men he had brought with him. He was alive as where the four, but the fate of the others would forever remain a mystery, and Valgard was no where to be seen. After he and his men recovered, Sayer surveyed his surroundings. About a half mile down the beach, Sayer saw the what looked like a wrecked ship. Hoping to find survivors, he lead his four men towards it. Little did Sayer know, but the ship on the beach was the same one Dwannis, Raskavas and Bodie had taken over, and Valgard had washed ashore just in front of their camp by the ship. Valgard was unconscious, and bobbing in and out with the surf. Bodie found him floating in the water, and proceeded to poke him with his Urgosh. It failed to wake him up, but bruised his flesh some more; dealing another point of damage. Bodie called out to the others that there was a body floating on the surf, and that poking it with his Urgosh was not waking it up. Hearing this, Raskavas walked over, snatched the Urgosh from Bodie and told him that he clearly wasn't poking hard enough. Raskavas lifted the hammer above his head, preparing to swing, but before e could, Dwannis snapped his spellbook shut and yelled for Raskavas to stop. He had finished studying his spells for the day, and was curious to see who this new comer was and if they were still alive; before Raskavas smashed him to a pulp. 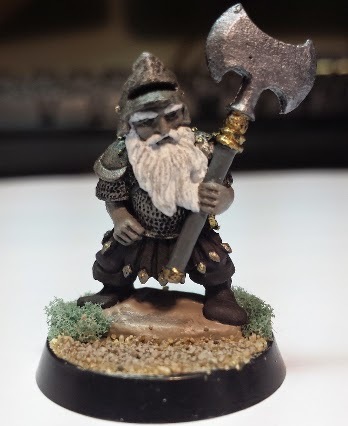 Dwannis discovered the duergar wasn't dead and that he was a cleric of some kind. A bit of Paranoia grew in Dwannis, as he recalled his duel with the last magic user he encountered in Elementia Game 5. So while Valgard was still unconscious, Dwannis cast Necrotic Cyst on him and then went to find his breakfast. Sayer and his men arrived just as Dwannis left Valgard. Raskavas was plerased to see his friend, and greeted him whole heartedly. Sayer told us of his journey and of the cleric Valgard. Realizing Valgard was the man floating in the surf, Raskavas had Sayer's men pull him out of the water. Using one of his Cure Light Wounds potions, Sayer woke Valgard. 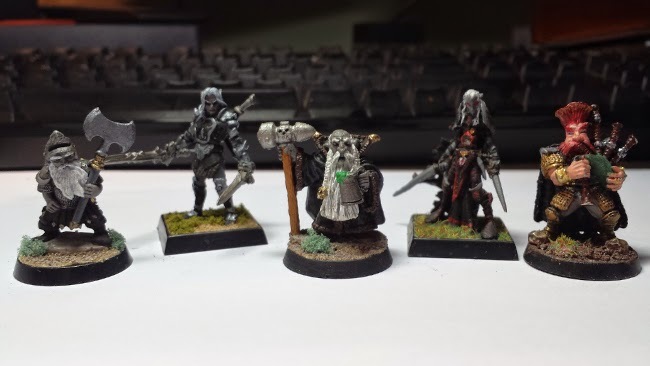 The Cleric started in shock as he awoke, but when he realized he was alive, he stood and introduced himself to introduced himself to the group. Dwannis greeted him, saying nothing of the Cyst, and asked if he was skilled in healing magics. Valgard replied he was a Cleric of Life and Death, and the medical arts were one of his specialties. He then proceed to use his magics to heal everyone to almost full health. With the party healed The group decided to rest for the evening, and explore the following day. The next morning, the party explored the island, and found the entrance to the great castle that stood on it. In front of its doors, Dwannis cast a Detect Magic Spell, and found the entire area to be radiating powerful magics. They would have to be careful. Sayer ordered his men to open the door, and they lifted the iron gates, and pushed back the doors, opening dark black portal into the castle. One by one, they all entered. Scene 6 Aren Bellwick's Note. Paraphrasing: There is a horror in the tunnels, don't look into its eyes... Another monster holds the key to something deep in the basement... Signed the Founder of Bellwick... 400 years ago. 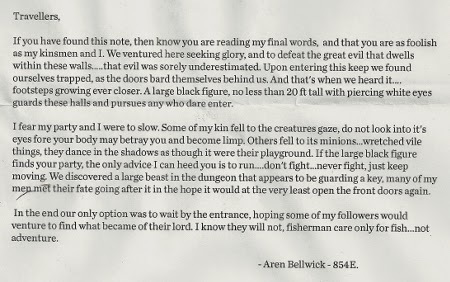 Dwannis realized if the note was signed by Aren Bellwick, it would mean that the illusion spell that was lifted in Conquest of Frey Game 8 had been cast almost 400 years ago. Something strange and much larger then any of them was at work here. Sensing the greater danger, Dwannis used Animated Dead to raise the body of Aren and two of his fallen men. This bolstered the party's ranks with some willing servants. With that they began to explore the room. They stood in a large chamber covered in doors, but the most prevalent was a large double door that stood at the top of a stair case. As they all looked at it, the doors began to shake slightly and the loud boom of footsteps echoed behind it, just like Aren's note described. The party was at full strength, and decided to ignore Aren Bellwick's warning. They felt they could deal with the horror, and charged into the room. Scene 7 A Duel with the Shadows. Valgard's Light spell scattered the darkness, but shadows remained all over the room. The horror Aren described was no where to be found, but the shadows themselves seemed to move. Bodie was the last one to enter the room, and as he passed through the door a shadow reached out and slashed his back, then disappeared as quickly as it came. Bodie felt his strength drain from him. Seeing the danger, the party rushed out into entrance chamber and stood their ground at the bottom of the stairs. Three shadows materialized from behind the door. The party's physical weapons would be useless against the incorporeal beings. All they had were Dwannis and Valgard's spells, and the +2 Great Mace Dwannis had found on the ship in Conquest of Frey Game 3. It was a vicious battle. Dwannis used his fireballs, and handed his Great Mace off to Raskavas while Valgard used his Searing Light spell. 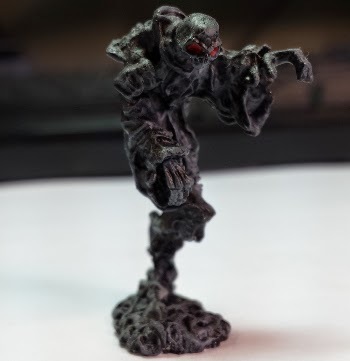 In the end the shadows were defeated, though at the cost of a guard, and most of the strength stat of the party's casters; Dwannis, Bodie, and Valgard. Deciding to not risk another trial with the shadows, Dwannis lead the party to the closest room on his right. Scene 8 The Dire Bats. They passed through the next chamber without looking around: Their haste quickened by a growing fear of malicious shadows. 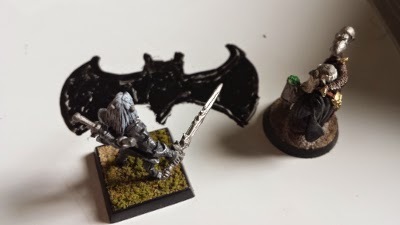 This was a shame, as Dave -the DM- told the group that they had missed some treasures. However as they walked through the chamber, Bodie noticed through a glass covered window that the castle seemed to be under water. The Octopus had submerged. Now they would either have succeed or die trapped beneath the waves! At the end of the chamber, they found a door leading to a long hall way. The squeaks of bats could be heard down the long dark tunnel, and four Dire Bats swooped down from above. And... cut to us fighting batman symbols. The bats should have been easy prey for the party, but in their weakened condition, they were a more challenging foe. It took some time to defeat them, but the party emerged victorious and more or less unscathed. Seeing there was nothing else in the room, the continued to the next chamber. Scene 9 A Place to Rest. Each door in the new room had a a way of bolting it from the inside, and as the sound of the horror's pounding foot steps drew nearer each party member rushed to shut their door. When the room was secure, Dwannis started to look at the bookshelves that filled it. He only found a single book of note, and it crumbled to dust in his hands as he clutched it. Disappointed, he returned to the group; who had set up a small camp in the middle of the room. The party decided to rest there for the evening, while Sayer and his men stood guard. And that was where we left off for the night. Dave had expected us to get a little further, and also didn't expect us to charge at one of the dungeons largest monsters right away. But was pleased with how his first dungeon for the group was turning out. Our retreat form the monster and the shadows gave us a chance to heal, recharge spells and even allowed most of us of us to level up! Raskavas and Dwannis reached level 10, Bodie level 8, Sayer level 7, and Valgard stayed level 6. The rest of the dungeon awaits us, who knows what mysteries it may hold!